I’ve recently re-discovered the thrill of the slower psychological suspense books where the thrills are gained from understanding a character rather than focussing on twists and turns. There is of course a place for both types of books, not least on my own bookshelf, but I think the former leaves a longer lasting impression than the latter where the enjoyment is often in the thrill of the ride. The Housekeeper was one of those books that crept up on me through Anne’s eyes. Anne Morgan has just been dumped by her boyfriend, a charismatic chef, worse still he was her boss. After doing the requisite moping around, resisting her friend’s attempts to get her back in the kitchen, she has an epiphany. For weeks she has been following Emma Helmsley, a lifestyle blogger and her daily tips have motivated Anne almost as much as she has spent her adulthood referencing Isabella Beeton’s Book of Household Management and the solution seems simple, she will become Emma Helmsley’s housekeeper. Now I don’t know about you but I feel somewhat queasy about someone poking around in my drawers and I’m no lifestyle blogger holding myself up as the perfect organiser, but Emma is in dire need of help. The rather disorganised household consists of herself, her husband Rob an academic who is in the midst of writing a book about a pioneer psychologist, and their teenage children, Lily and Jake. Anne has her work cut out for her, there is plenty of clutter to sort out in the house and as we all know, no sooner is one mess sorted out than another appears but she’s enjoying the slower pace, no more fifteen hour days in a busy kitchen. It doesn’t take long for the façade the couple present as they network their way around London to be revealed for something else entirely. The Housekeeper had me gripped because of the characters; I was fascinated by Anne’s choices and although they wouldn’t have been mine her background made them entirely plausible. As for the family… well all four were equally fascinating although Emma was more frequently in the picture than the others. A special shout-out has to go to the friend Julie who was that voice of reason often lacking in psychological fiction but will her voice be loud enough? The whole book was written assuredly, the author really making her mark by painting a picture of the house itself, Anne’s flat and the more mundane bus rides home at night, bringing to life the minutia of a young woman’s life while keeping the pace absolutely steady thereby avoiding that deadly speeding up and slowing down jerkiness. The steady pace also allowed me to absorb the excerpts that headed up each chapter which changed from Mrs Beeton’s household tips, to Emma’s motivational statement to parts from Rob’s book about the pioneer psychologist who treated those with disorders outside the more traditional hospital environment. I’m not going to give any more of the plot away but suffice to say there is an interesting look at a subject that isn’t often tackled and refreshingly it was done without the usual hullabaloo. The Housekeeper’s very strength the almost reserved way that the truth is revealed and interestingly it isn’t all focussed on one character alone. This book made for a totally satisfying weekend read, with plenty to ponder and wonder about when I wasn’t salivating over the descriptions of the food, maybe a housekeeper would be nice after all! 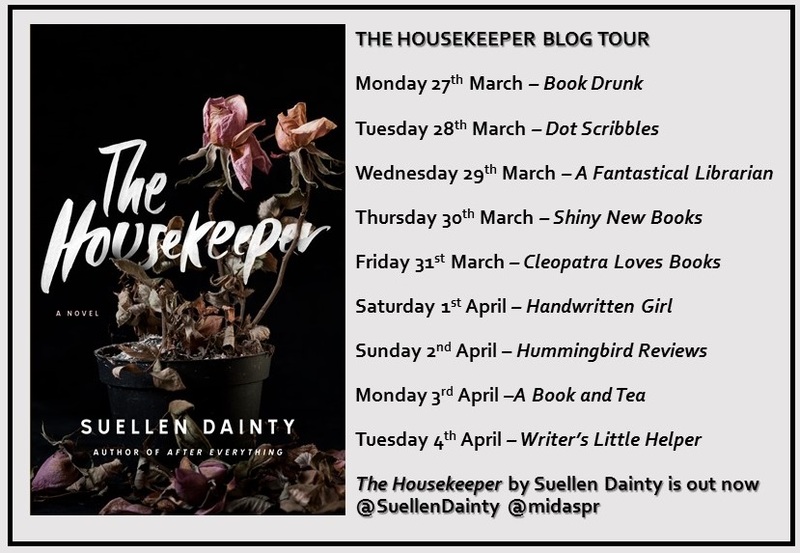 I’d like to say an enormous thank you to Eve at Midas PR for inviting me to take part in this blog tour and Suellen Dainty for introducing me to the world of household management! For some reason I’ve had it in my head that this isn’t a book for me but your review has me wanting to read it asap. Thank you for opening my eyes to it, I’m going to buy a copy as soon as I can. Great review! It sounds like exactly the sort of book I’m in the mood for at the moment. I think I might treat myself and order it today. I think you would enjoy this one Margot it has elements that aren’t regularly explored and remembers to be entertaining along the way. I think I’d feel somewhat inhibited if my house was as much of a mess as Emma’s while simultaneously holding myself up as some lifestyle guru! I’m midway through my review (so I wouldn’t generally read yours, as it depresses me at how crap a reviewer I am! Plus I’d worry that I’d unintentionally plagiarise your work – hmm!😁) and I just so wanted to see if your thoughts were the same as mine – YES! I read the last 80 pages without moving, utterly glued to the pages….loved it. And someone doing my washing and changing my bed…the thought of that made me feel ill! I have the same problems with reading other reviews when I’m writing mine – you’re far too self-critical!! I really enjoyed the peeling away of the characters and that ending was perfect! Oh, great review! I recently downloaded this book, and now I’m very eager to read it. I love when an author shows us the world (houses, bus rides, etc.) in which the characters go through their motions every day. Thanks for giving us a peek into what sounds like an awesome story. It is lovely sometimes to take in the view while we get to know the characters and Suellen Dainty did this in a really natural way. I hope you enjoy it as much as I did Laurel. Thanks Cleo. This one is on the list to be read … sometime. Haha I have a huge pile of those! I keep telling myself I can’t read all the books but I am glad I said yes to this one as it felt quite different to the normal fare in this genre. Ooh I like this. Sounds different. It is quieter than many in this genre but I’m finding I enjoy that style more in many ways. I’m glad to hear you liked this one! It has such an interesting premise. It’s definitely one I hope to check out at some point! 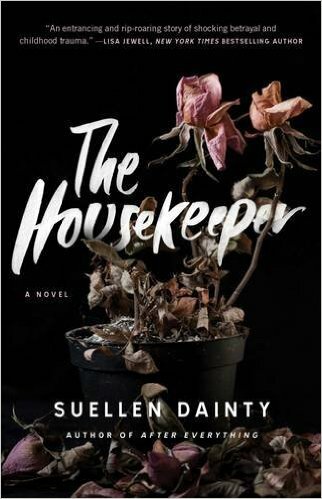 I actually prefer the more psychological suspense novels, so The Housekeeper sound perfect. I had a cleaner once, and cleaned up before she arrived so as not to have her thinking I was a slob. Never again! I love the sound of this. A bit different and, like you say, slower books give you time to get to know the characters.